Have the Courage to Try Something New… Try Yoga! Have the Courage to Try Something New! Try Yoga! Isn’t it time for you to try yoga? Many people hear about the benefits of doing yoga but will put off giving it a try, often because of fear of the unknown, fear of failure or judgement from others. There may be many other points in our life when such fears stop us from trying something new. We decide that the risk of the possible negatives is enough to make us sacrifice the more likely positive outcomes. Staying in our comfort zone seems like a safe option in the short term but in the long term it means we miss out on the chance to experience something rewarding and we are likely to have regrets in the future. If you think of the times when you have been most excited about something in your life or something you are proud of it has probably been a result of stepping outside your comfort zone, making a change, challenging yourself or trying something new. We would never feel the satisfaction of achieving something if we never attempted it due to fear of failing. I recognise this situation myself when I was thinking about teaching yoga. It was something that I was very interested in doing but self-doubt and lack of confidence almost held me back a number of times. The idea of training in India for a month really excited me but having never been outside Europe and having never been away for longer than two weeks, I didn’t know what to expect and I started to focus on all the things that could go wrong rather than the benefits that I could gain from the experience. Luckily, with the support and encouragement from my yoga teachers and friends, I decided to push myself outside of my comfort zone and I ended up having one of the best experiences of my life. 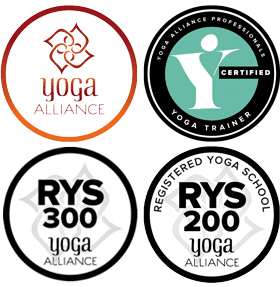 Even when I came back to the UK with the excitement of being qualified to teach yoga, the nerves of teaching my first classes almost caused me to turn my back on teaching altogether. I knew the longer I left it the stronger the self-doubt would become so I forced myself to get in touch with local gyms to cover classes so that I made the commitment to try teaching before I changed my mind. Although I was worried about not being good enough to teach, I knew that if I never tried, I would also feel like I had failed with the added frustration of never knowing if I could have done it. Friends and family will want what is best for you and can help encourage you to do what will be good for you. Sharing the experience often makes something seem less daunting and you can encourage each other. I had a private yoga client who was very nervous about starting yoga so she brought her daughter along for the first lesson. She really enjoyed the lesson and booked her next lesson straight after the class. It was great that sharing the experience with someone she knew made it seem less daunting and it made her commit to follow through with it. A big change or challenge can sometimes seem impossible to achieve. For example if you have hopes of running a marathon, build up your confidence by tackling some smaller runs first. You can have it in the back of your mind that you would like to run a marathon one day but you are not putting pressure on yourself to do it straight away. Completing the smaller runs will give you more confidence that it is achievable. Also, having a plan and a realistic time frame can help you visualise how it will be done. This will give you the confidence to know you can succeed at other new things rather than seeing failure being a likely outcome. The biggest way of failing at something you wanted to do is not even attempting it in the first place. If you really want something you will do everything in your power to prevent yourself from failing meaning the possibility that you will fail becomes small. And if you do end up failing, the situation probably won’t be as bad as you feared because we sometimes imagine the worst outcome. You can also get satisfaction in knowing that you at least gave it your best shot. We can actually learn a lot from the things that didn’t go well and it can put us on the right path for the next chapter in our lives. If you know what you want to achieve and what you need to do to get it, this will keep you focused and ride through the feelings of uneasiness. Visualising yourself achieving your goals will help you believe that it is possible. Be self-aware when you start thinking negatively and instead focus on the positives and the benefits you will get from the new experience. Often it can be easier to think of the advice you would give a friend in your situation. Always enjoy the journey and the knowledge you are working towards something you are passionate about achieving for yourself. If you know doubts could creep in it helps if you are able to force a commitment such as booking the class so that it is already arranged. The theme with the points above is about having the confidence to take on that challenge or new activity. The more you expose yourself to new situations then the more confident you will be about taking on new things in the future. You will also strengthen your character, have a greater zest for life and have more interesting stories and experiences to share. There are specific poses in yoga that can help improve our confidence such as strong poses such as the warrior poses or those which open the chest and heart and encourage us to stand strong and proud. The whole practice of yoga helps us clearly set an intention, trains us to work slowly and methodically, have patience, recognise and enjoy small steps towards progress. These lessons can be taken off the mat to give us courage in our everyday lives. So perhaps you are thinking of giving yoga a try and if so what are you waiting for? DON’T worry about what others think:Yoga is a personal practice and everyone in the class is concentrating on themselves. People will have more admiration for you if you try something new and do something that is good for yourself and your body. Whether you want to try yoga or something else that is new – give yourself the chance to experience something exciting and challenge yourself!